Here's the third release in the Fishdom series. And it is only getting better! The game is bright and fun and fast and entertaining. The fans should not be disappointed but rather impessed with some new features. You can either run through it or take your time and enjoy. The match-three boards are quite challenging this time. Plus, you can intensify it by playing it in the timed mode. 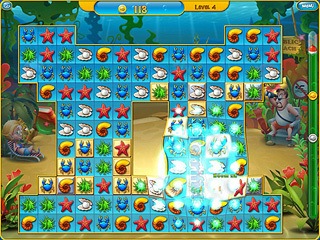 You are to have some more fun with the fish in Fishdom in their tanks. The fish are now all 3-D! This might be a special attraction for those who are already fans of the series. The fish now have their own personalities and interact with each other. Making it personal is definitely a good move on behalf of the developers. The game's presentation is great. The graphics are bright and the music is jolly. It is enjpyable to be there for a few hours. The match-three boards are quite challenging this time. Plus, you can intensify it by playing it in the timed mode. But your hard work is always rewarded here. 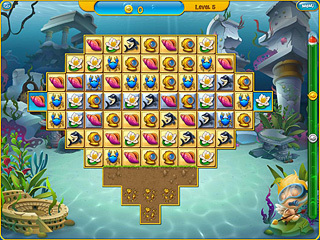 The game offers literally tons of rewards and bonuses, like a 100 bonus levels. If you are not into rewards winning, you can focus on making money in order to be able to decorate your tanks as you wish. The game is really nicely put together. There are some great features many fans of the genre will enjoy. Incredible interview. There are so many inirpsing and strange thoughts in there, makes me want to make a game about a headless 19th century pole vault champion from ancient Egypt who just discovered that he can change influence the political stance of the government by jumping different height patterns and whose name is Hungry Horus in reference to a game called Hungry Horace which was basically a Pacman clone, if I remember correctly. Can pole vault and Pacman mechanics be combined? Reply:January 17th, 2011 at 2:38 pmYou don't even know in what danger you were posting under this name. Our spam security is in shambles and I'm dealing with all the bots manually.Dr. Bargain & his cheap wrist watch empire Reply:February 12th, 2011 at 1:19 amHaha, I almost thought so. I guess you could even regard my post as brain spam, reading it again now I can't really reproduce that stream of consciousness. By the way, hello cactus, your games are good! This is Fishdom 3 Collector's Edition review. Download this game here.